Vending machine priced by grams of fat, Google, San Jose, California.jpg, originally uploaded by gruntzooki. This machine is an exception. 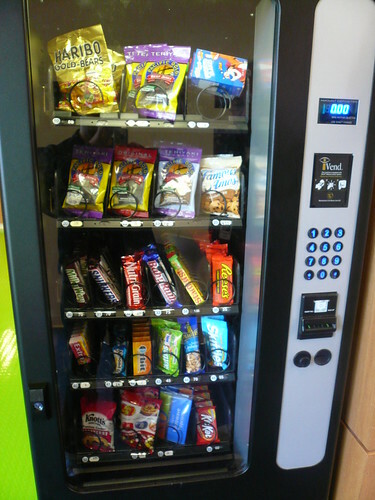 And unlike most vending machines, the food is priced based on how bad it is for you. Items high in fat and sugar cost more. The most expensive item I saw was a $4.55 bag of Famous Amos cookies. (You can see it at the right end of the second row.) It’s a terrific way to illustrate the externalities that we don’t take into account when buying food. Food marketing is based on increasing profits and not health. At restaurants, convenience stores and similar places, they do whatever they can to get you to consume more because it adds straight to their bottom line while it adds straight to your waistline. I once heard a professor on a radio show asking if an 8″ pizza costs $10, how much should a 16″ pizza cost? Most people would answer $20, because they (incorrectly) thought that the 16″ pizza is twice the size of the 8″. The “correct” answer to the question was $40, because a 16″ pizza actually has 4x the area of an 8″ pizza. He’s clearly a math professor. The marketing and profit maximization answer is somewhere around $14. Most of the cost of the pizza is in telling you that they sell pizza, the fixed costs of operating the store and delivering it to you. The incremental cost of a 16″ pizza versus an 8″ pizza is negligible. The bulk of the extra $4 is pure profit. The goal is to set the price difference low enough that you feel like a chump if you buy the 8″ pizza. Marketers also use naming to influence your consumption. Five Guys, a hamburger chain on the East Coast, offers a choice of a “Cheeseburger” or a “Little Cheeseburger”. What guy is going to order the “Little Cheeseburger”? On the other coast, In-N-Out Burger doesn’t provide a financial incentive to consume more. Their combos cost the same as the individual components put together. This entry was posted in advertising, fun, google, random. Bookmark the permalink. I like your observations about portion sizes, incremental costs, and marketing! Hey, this violates the no-photographs rule. And it’s giving away our nutritional secrets too. Get him! One other thing: Google color codes the food labels in the cafeteria to indicate how bad things are for you. In “response” to growing concern over obesity, the restaurant industry in general has been introducing smaller portions, with no real intention of actually selling them, since it’s not in their interest. Check out the NYT editorial by Barry Schwartz, a psych prof at Swarthmore, who wrote the excellent book “The Paradox of Choice.” With the larger size being the “default” option on the menu, the chances of someone ordering the small size greatly diminishes. There is a least one cafe in Sedona that sets the menu by calorie, fat, carbs and sodium. It is Prix Fixe so the consumer must look at the description/nutrition to choose. Yes it is at a spa which is probably the incentive. PS. I order the little cheeseburger…with bacon.